Wherein Tess of the d’Urbervilles meets Jane Austen. I often name my sheep after characters in the books I am reading at the time they are born—Gudrun and Gerald from Women in Love by D. H. Lawrence, Jude and Sue from Jude the Obscure by Thomas Hardy, and Marcel is named after Monsieur Proust, of course! As a huge Thomas Hardy fan, I also have a Tess. 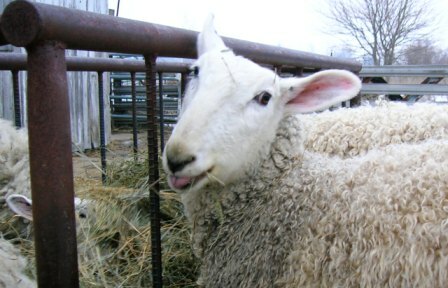 I recently had an article published in the new issue of Jane Austen Knits (Interweave Press Summer 2012) about Leicester sheep during the Regency period, and I included a picture of Tess! Tess is one of my most beautiful ewes with strong Border Leicester characteristics. She has a pronounced “roman nose”, or bow-shaped head, typical of both Border and Bluefaced Leicesters. 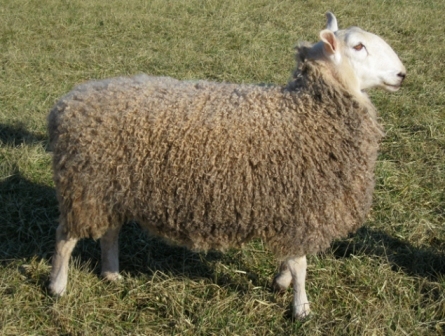 She has a curly, lustrous fleece and a sturdy stance. Tess at 2 months old. Unlike Hardy’s heroine, my Tess is convinced she is not only the master of her own fate, but everyone else’s as well. She guards the other sheep in her group and does her best to lead them to the greenest pastures. Tess at 9 months old. Yes, she is actually sticking her tongue out at me! Tess in January 2012. Haughty as ever. Jane Austen wrote a letter to her sister, Cassandra, in 1798 that included news of their father’s flock. “. . . I am likewise to tell you that one of his Leicestershire sheep, sold to the butcher last week, weighed 27 lb. 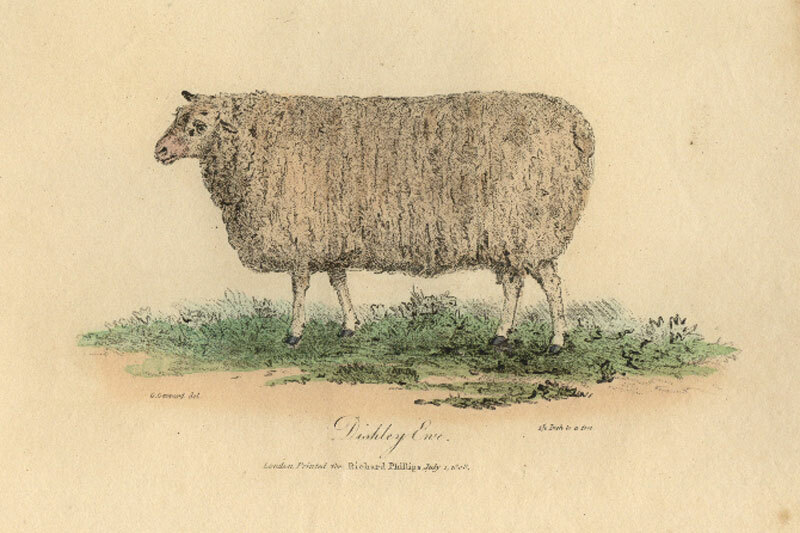 and 1/4 per quarter.” Sheep carrying the Leicester name in Jane’s day were undergoing changes that would influence the as yet uncharted field of genetics for generations. 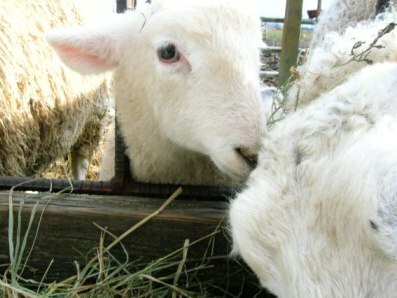 A Leicestershire farmer named Robert Bakewell (1725-1795) began improving the sheep on his farm in the English Midlands. Bakewell developed a new breed, which he called the Dishley Leicester or New Leicester, through his own system of selection, now called Line Breeding. Bakewell would eventually become one of the most noteworthy figures in the history of animal husbandry. I just love learning about the long and circuitous history of the sheep that graze outside my windows as I write. I can imagine Jane Austen looking up occasionally from her work to see her father’s flock grazing on the grounds of their home at Steventon Rectory. 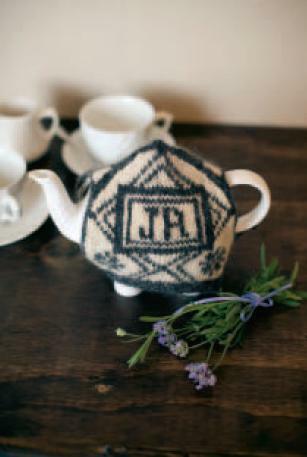 I designed Mrs. Smith’s Tea Cozy to accompany my article, “Leicester Sheep in Jane Austen’s England.” Using my own handspun Border Leicester for the pattern was very exciting! Both shades are natural color. The white wool is actually from Tess, because it was just more fun that way! I based the pattern on Regency era pinballs, or pincushions. You can see some great examples in the Victoria and Albert Museum collection here and here. I love learning more about Tess! Thanks, Amanda! And Happy Birthday to you, too! Thanks, Julie. I hope you are well!